Design a personalised iPad Mini 1, 2 & 3 hard case. Your photo printed on the back and sides. Solid, durable case which offers an unmatched level of protection. The full print iPad Mini case is one of our favourite products. 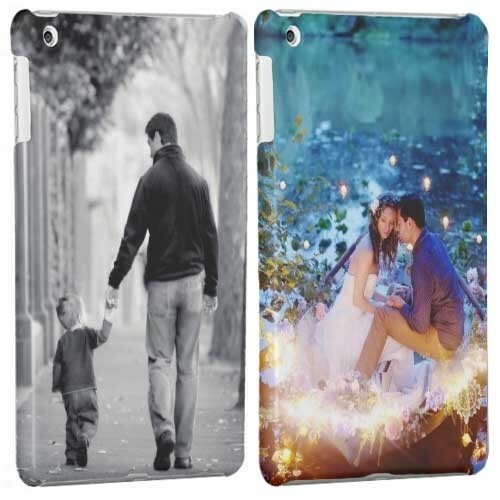 Your personal design will be printed on the entire case, even covering the curved sides. The case is not only a stylish accessory. It ensures that your iPad mini is well protected against potential fall damage and those annoying scratches! You are free to design that case how you please. Your self made design, printed straight on the case! Using your own photos to design an iPad case makes this product one of a kind. Once you click on the "Start now!" button, you will be brought straight to the design module. Here you can upload any of your favourite photos, images, patterns or pre-made designs. Place them perfectly and add a little personal text using our text module. There are many fonts and colours to choose from. Your design will be printed on the entire case, so keep in mind that some of your design will be printed along the curve of the case. Enjoy! You want to receive your personalised iPad Mini full print case as soon as possible. We ensure that your case is shipped within 24 hours of purchase. If there are any problems with your design, one of our specialist will contact you to resolve the issue. Our packages are design to fit straight through the mailbox, so you don’t need to stay home! Shipping is fast and reliable.